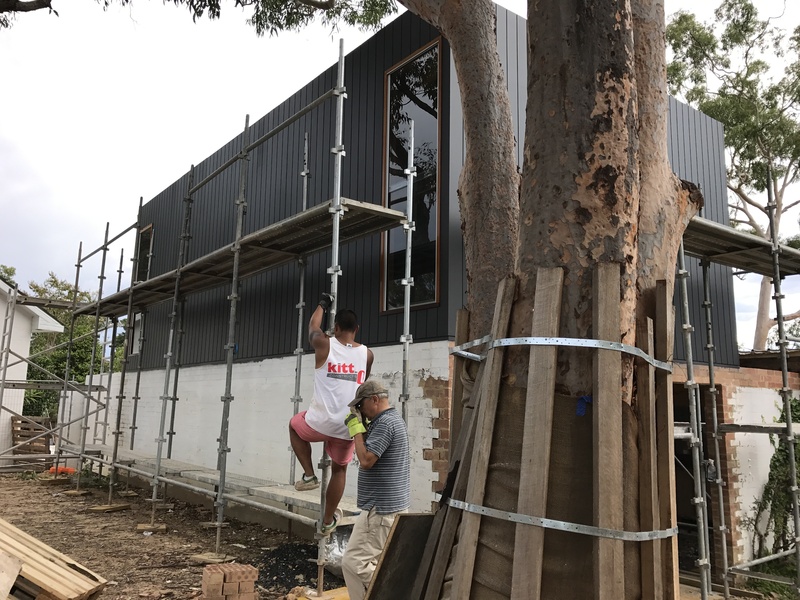 Progress Photos Feb 2017 + | Sydney House. 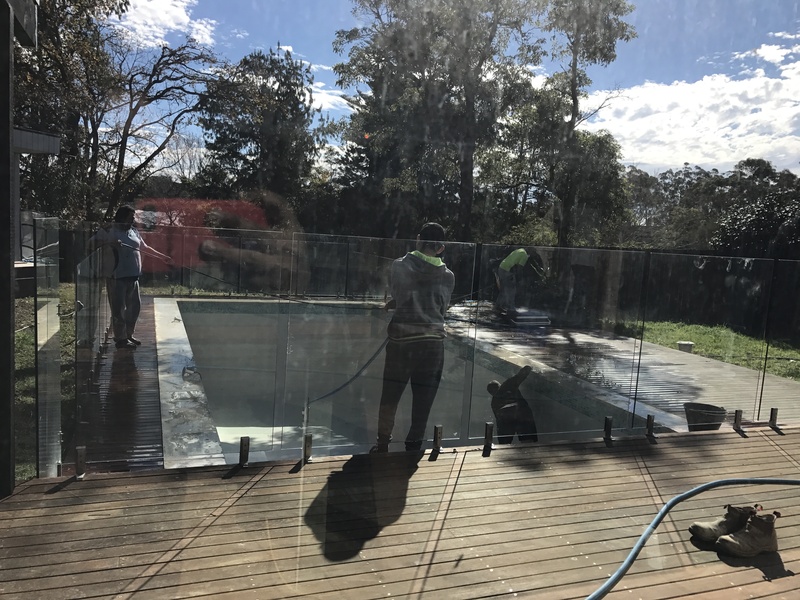 February 2017, the pool deck area is ready for glass fencing..a massive job which we are doing with the help of our carpenters. 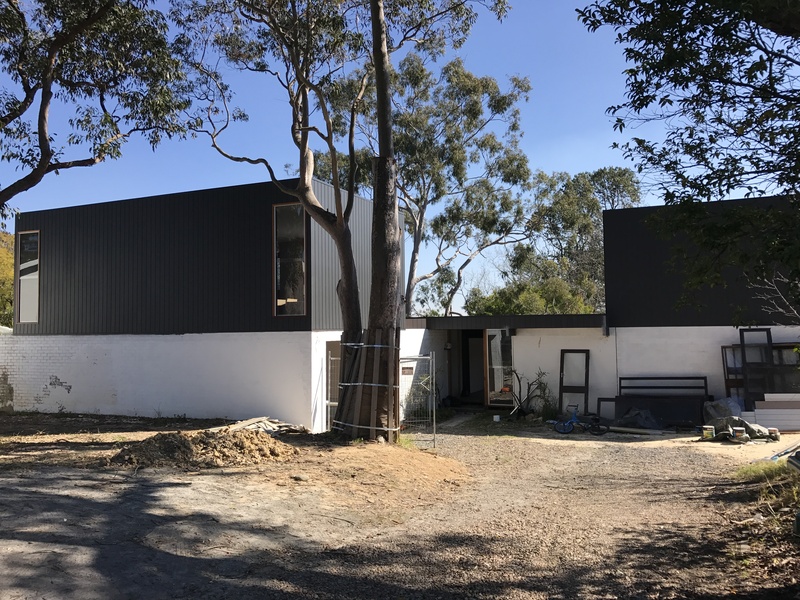 View from the pool deck looking towards the house, with the garage/main bedroom space about to get it’s Weathertex cladding. 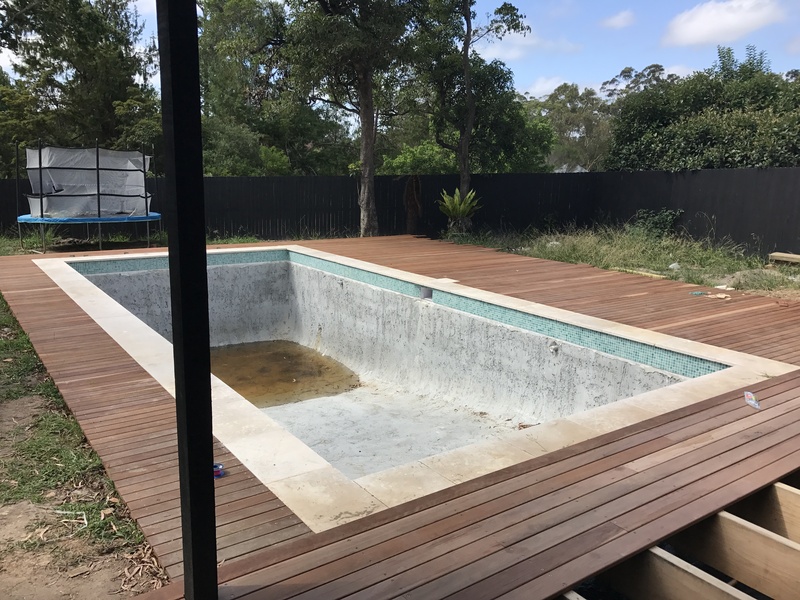 Deck is completed around this time as well…that’s 4 solid weeks of decking! 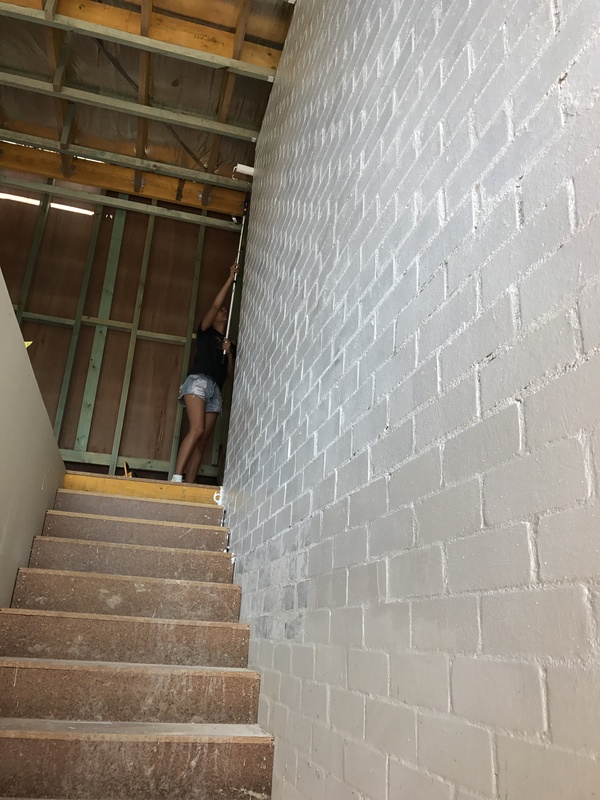 Priming the brick wall which was once the exterior wall, now extended to the ceiling and forming the staircase to the family room. 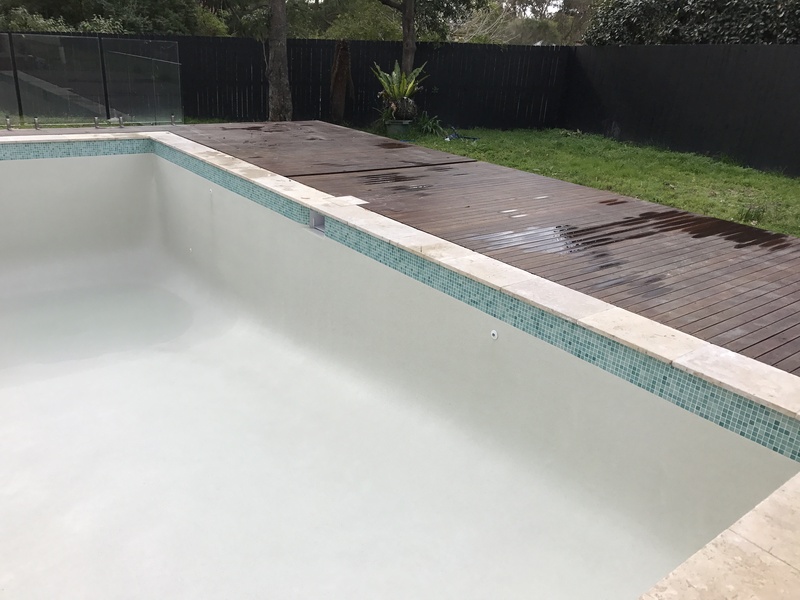 It was 40 degrees a few days in a row during the pool fencing process. 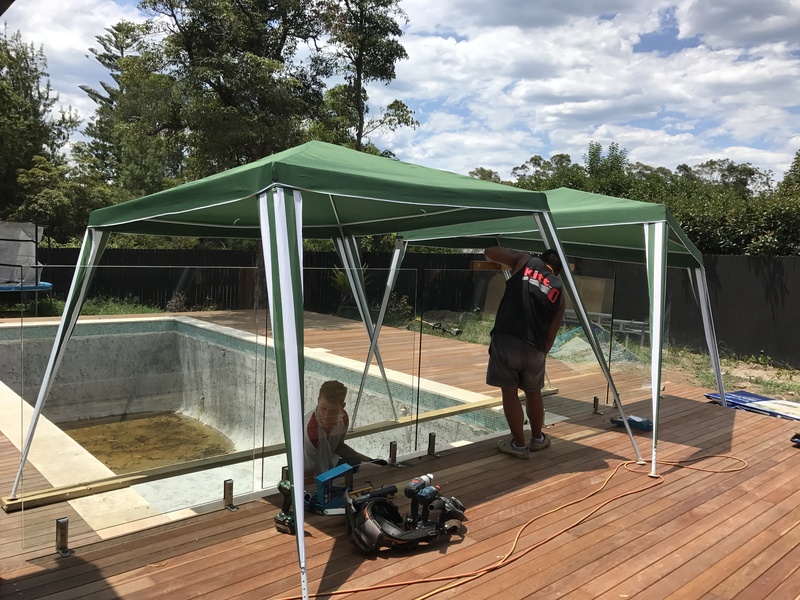 Pool fencing continuing. 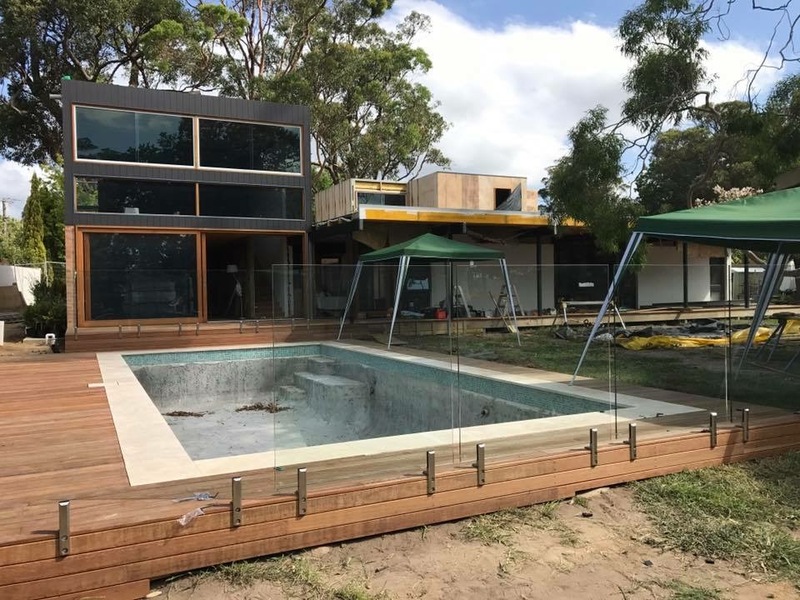 We used stainless steel deck-mount spigots for a streamlined option with the Everton glass range. Only trouble is, we had 2 panels on special order for a complying height required from the main deck. One arrived correct, the other was the wrong side. 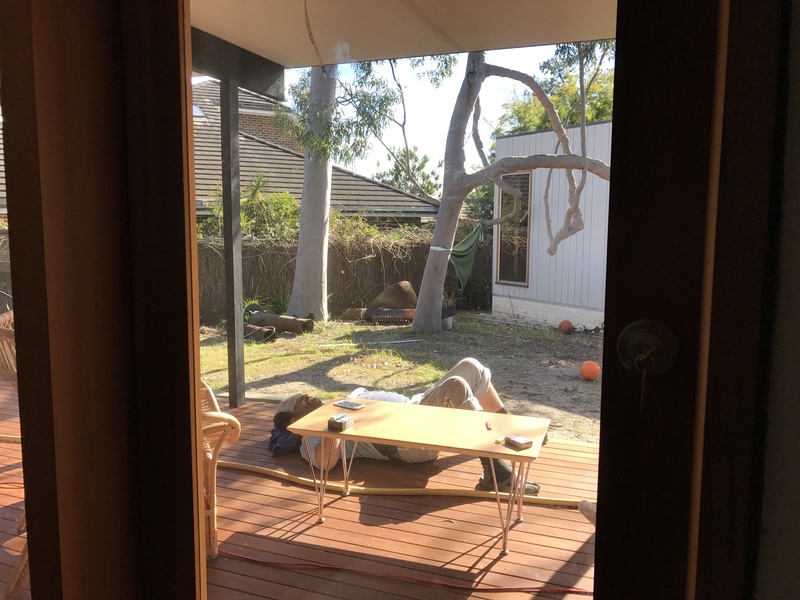 But it took 5 weeks for the new piece to come because Bunnings had sent to somewhere in Grafton by mistake…!! 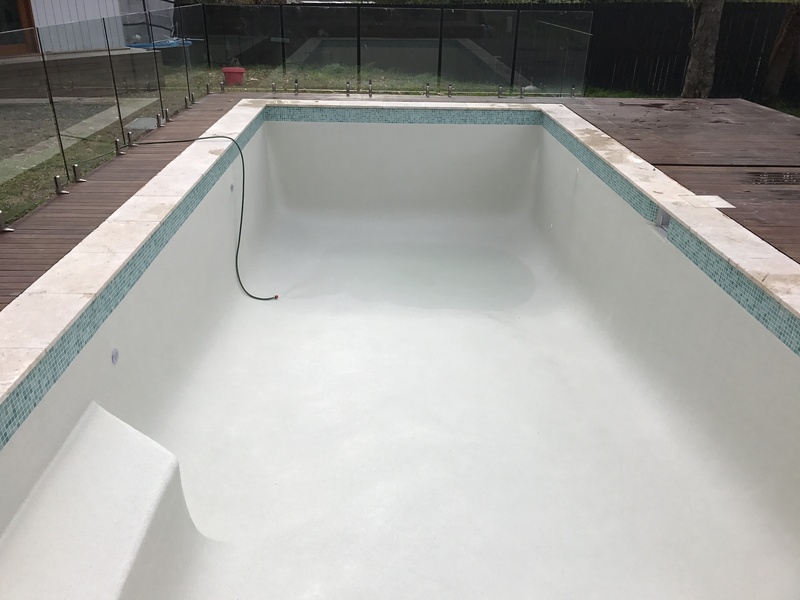 so further delays to the pool certification occurred until March/April. Sigh. Apart from that the Trades Desk at Bunnings has been good. 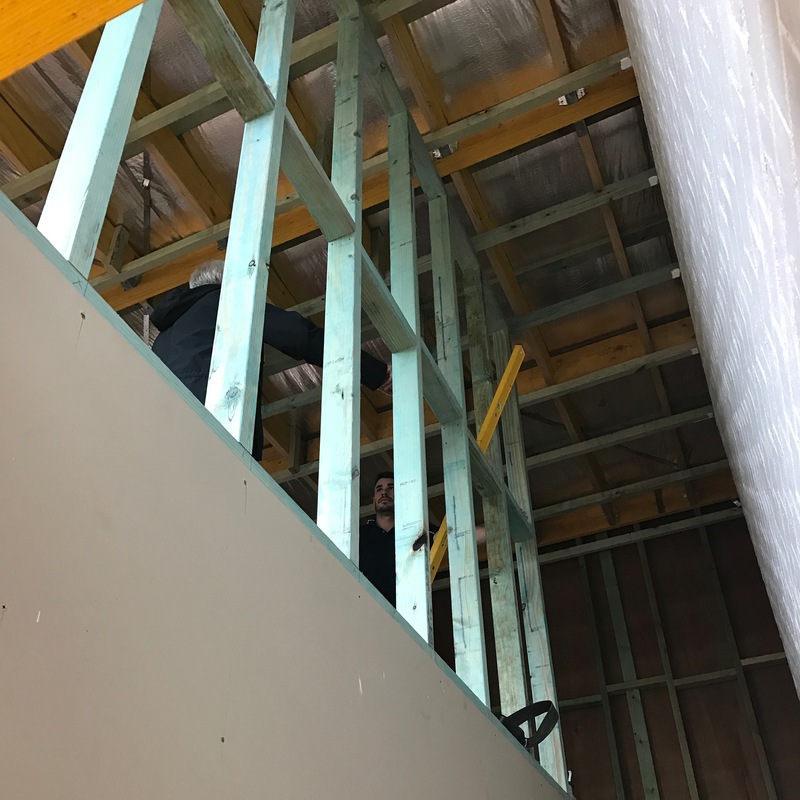 Stud wall and sheeting going up for the family room/stairwell. Getting the final coats of paint on the brick and plaster walls will have to be done last in a very squizzy space. The old bedroom windows/doors just before they were replaced with new cedar windows. 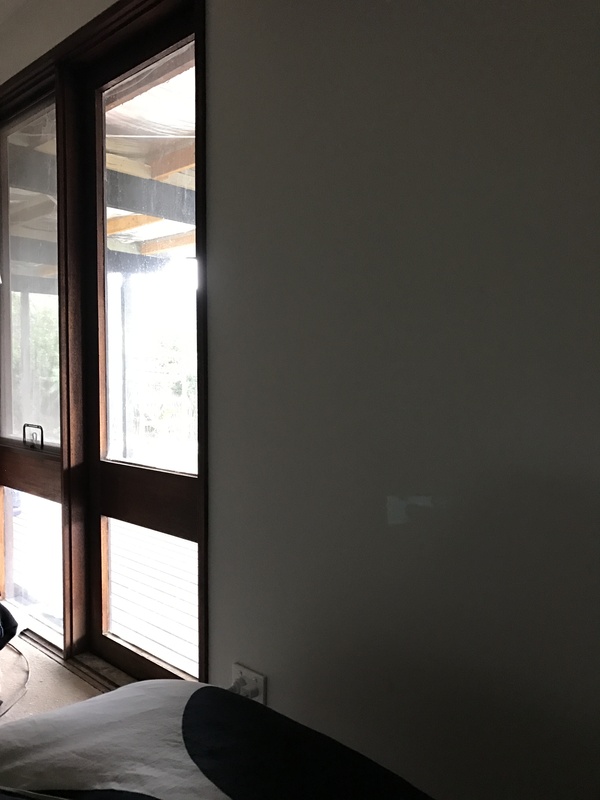 We grew attached to these windows but they were not able to take new Low E glass which we needed to regulate the house temperatures as the bedrooms face north west. I’ll be posting the photo of the updated windows/door when the garden isn’t so awful to look at! 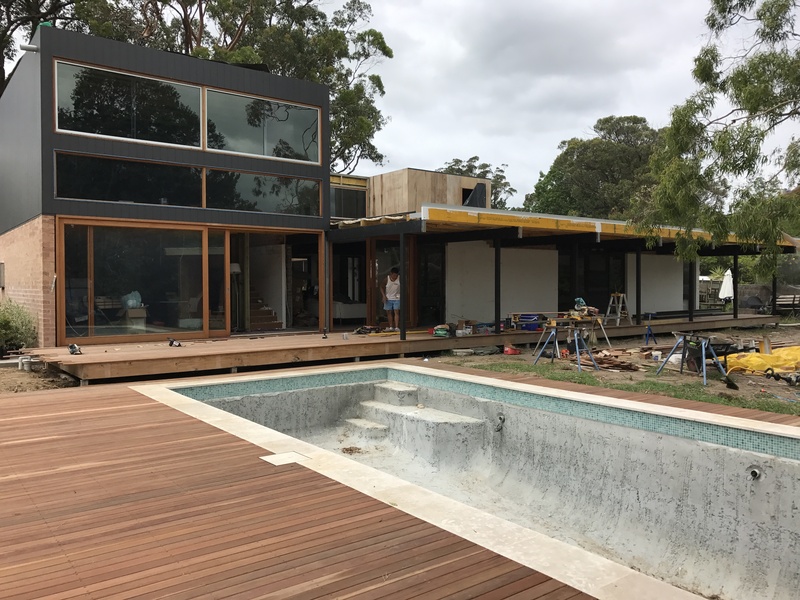 With cladding up and leaks being worked out, we get to cleaning up the inside of the new kitchen which is the wing that has been added to the Eastern side and looks over the deck and pool, with the family room above. Frankly I can’t wait to hide away up there! 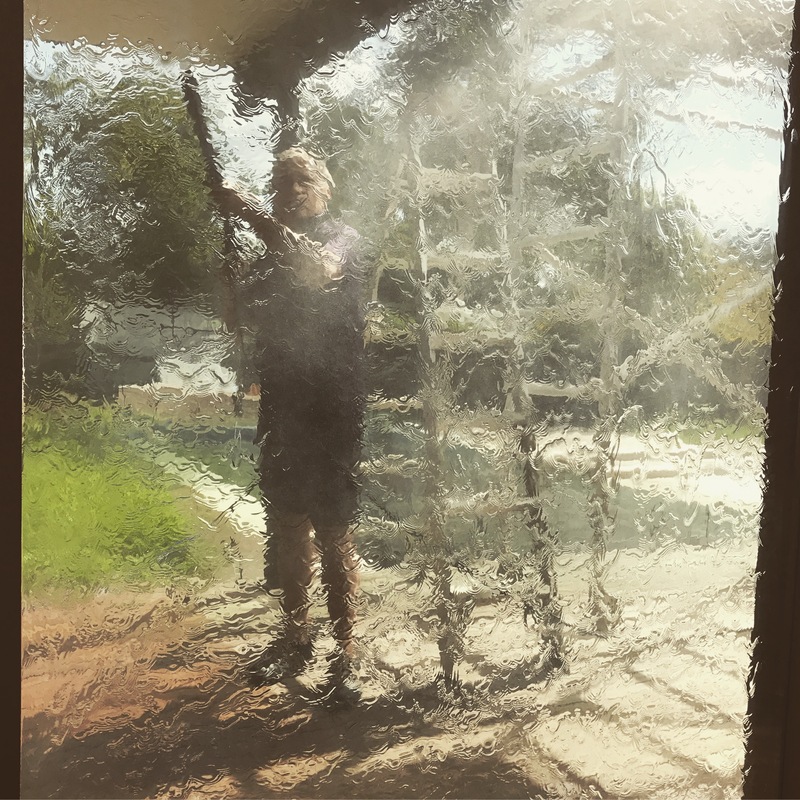 April: The large windows needed a good wash after all the decking dust and grit, and so that we could apply a 2nd coat of Sikkens oil once completely dry. 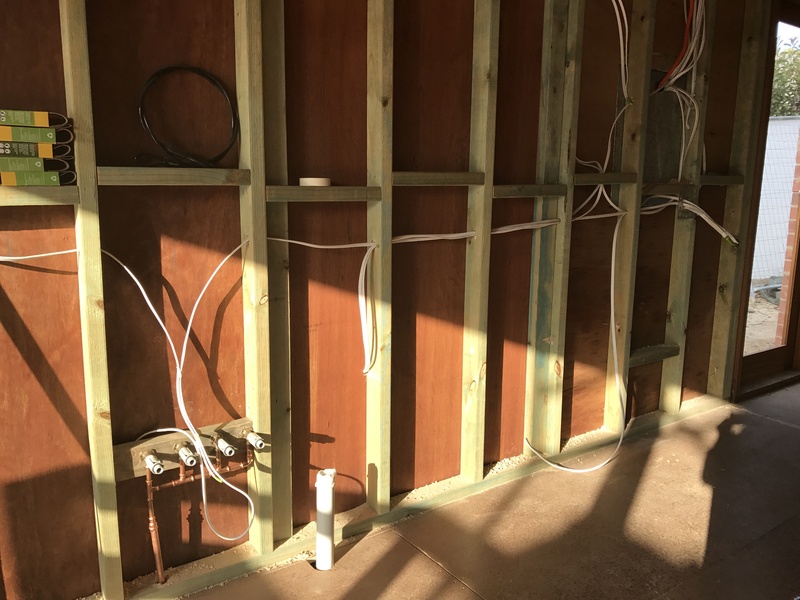 May/June: It doesn’t look like much, but it’s the plumbing for the new laundry room which will be part of the garage. The original laundry has asbestos and we’ve decided to free up that tiny room and use it as a walk-in Linen press for the whole family. 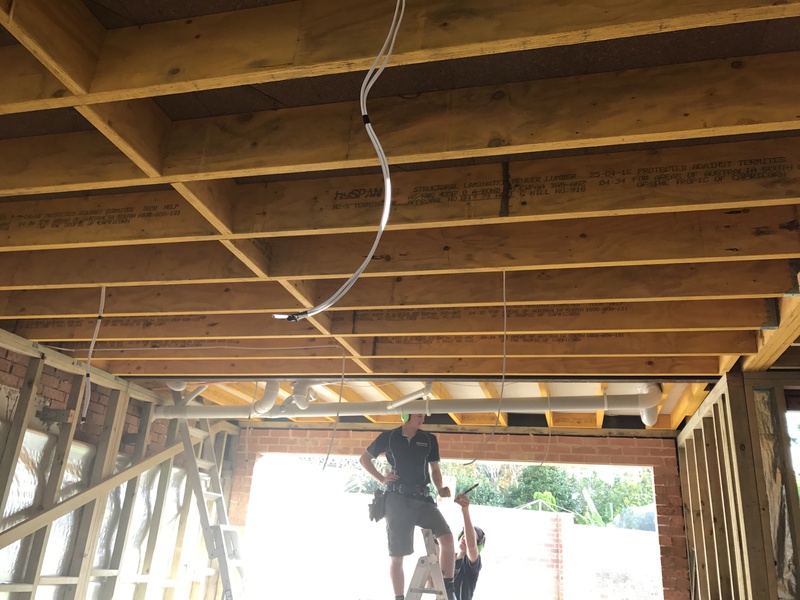 May/June: The plumbers doing the final work for the master ensuite upstairs. Once sheeted, the pipes get a bulk head to conceal everything neatly. May/June: Kitchen plumbing in the new section. Still wondering if we should take the offer from our plumber for a ZIP tap. Anyone got one? One of the pool concreters having a quick break after a sandwich. After a 5am start, it’s already been a long day. Thankfully the sun is shining for them. 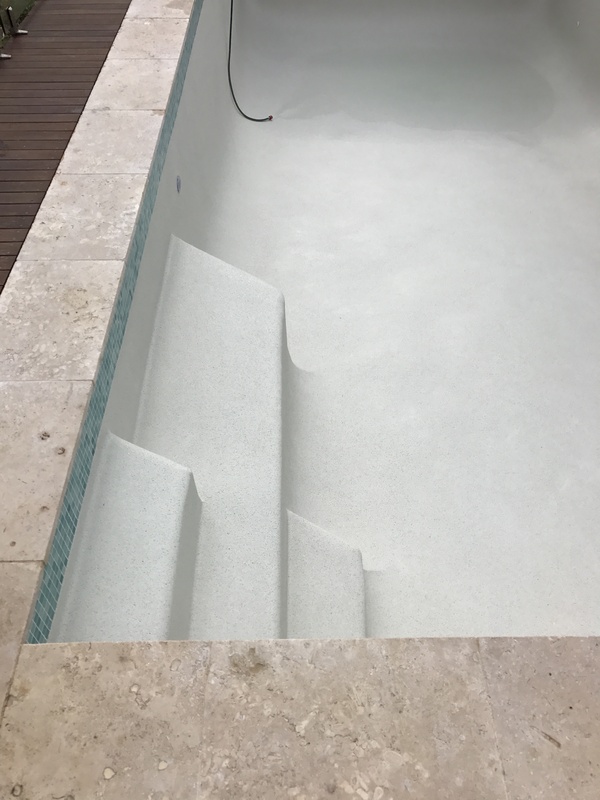 The pool interior is Fine Screed Pebble in Arctic White, so that the water is eventually a summery blue. The work these concreters do on the interior is a work of art. It is perfect, including the curves and corners. At this point they are able to take the overhead tarps down and start filling. Our water bill suggests it was about $300 to fill. 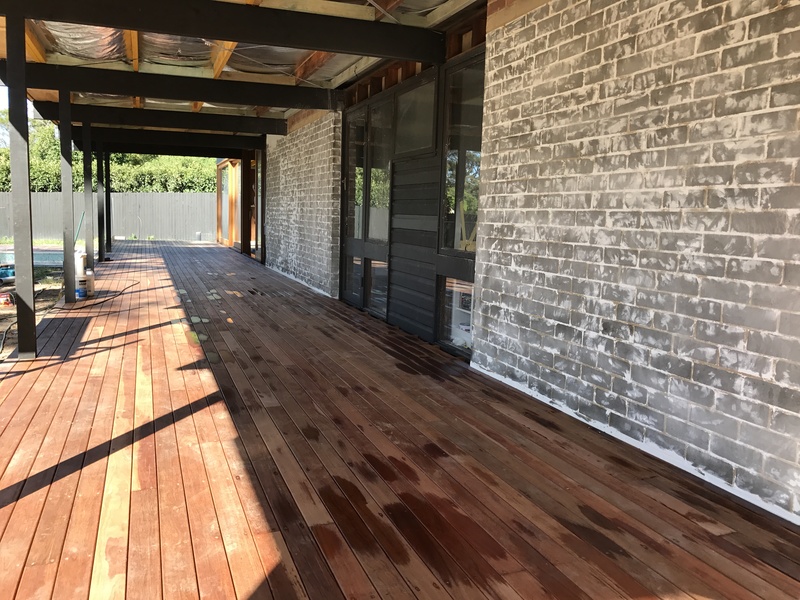 Close up of the fine screed pebble interior, the travertine coping, Spanish mosaic water line tiles and Grey Iron Bark deck. In this photo the travertine is dirty, once pressure washed it is a very pale paver. After a week and with the pool pump now connected, it’s blue! Fortunately the weather has been clear with no rain. We’ve been able to top it up more and get it really blue. 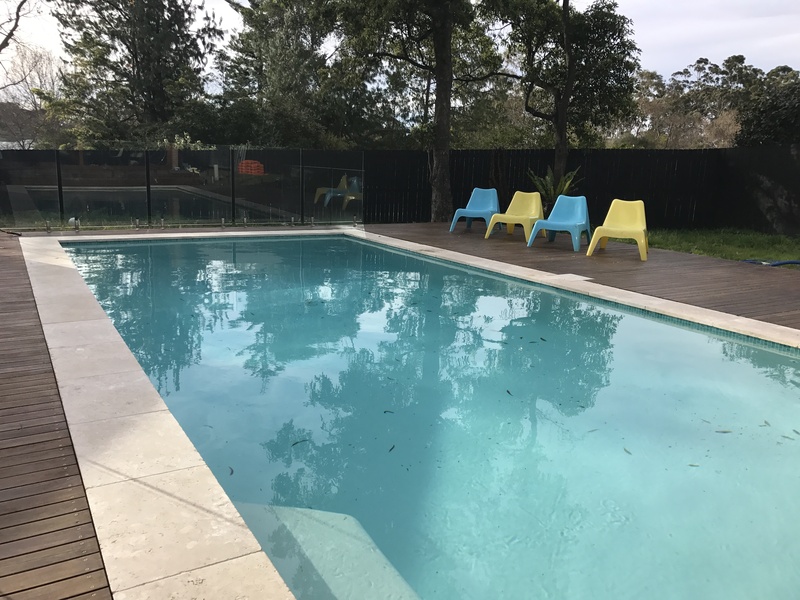 We have also had to use a Duck repellent in the water as they were suddenly appearing after a few days of the pool being built and dive bombing and pooping everywhere! 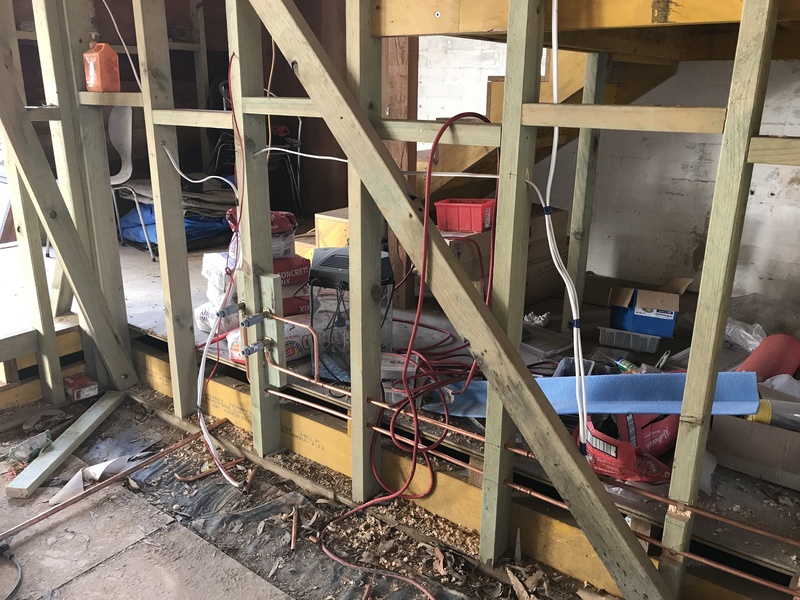 Now we can concentrate on the insulating as the plasterers were scheduled for August. Here we are in early August 2017, with the original Lowline still giving us the long lines we so loved, alongside the extension to the East and the new black volumes. 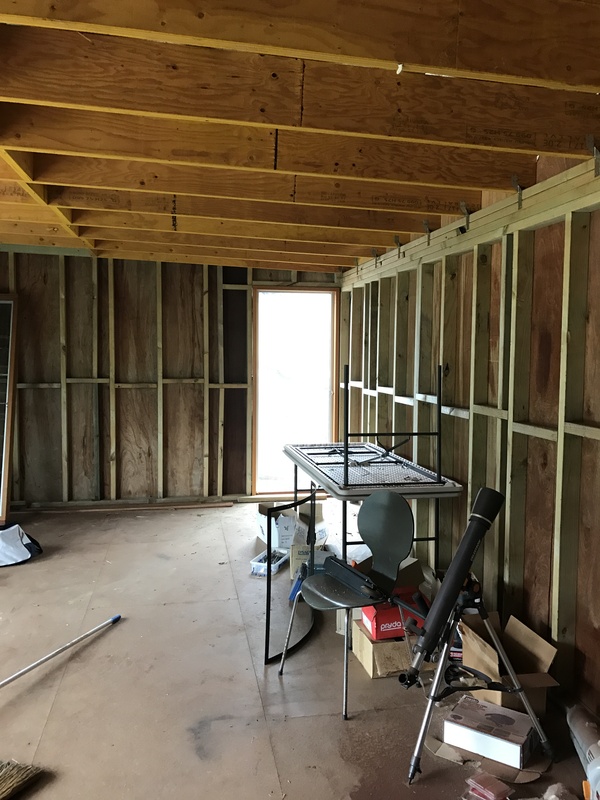 Head to my next post to learn about making the old house and new additions more energy efficient for today’s standards.